Hand clap push ups is a very powerful chest muscle exercise you can do without weights at home or gym to build muscular chest with explosive power. And guess what? The Plyometric push up improves your bench press too. The best way to build a specific muscle is to target its main function. Pectoral muscles are built for explosive power. And this makes handclap push ups an excellent addition for muscle builders. Secondly the role of plyometric bench press has recently been proven to increase your pressing power. But throwing a bar in the air and catch it is a bad idea. HandClap push ups does the same job, only safer. Thirdly, handclap push ups can be done without weights, while travelling or in the comfort of your home. Get into regular push up position but put your hands and feet slightly wider than shoulder width. Keep your weight on the bases of your palm. Drop until your chest almost hits the ground. Push with the base of your palm to generate maximum power. Martial artists use the palm area to break bricks. Push explosively as if you have just touched a hot stove. Clap your hands mid-air and land back on the same spot. The Clap that Build Muscles! Push up with elbow power. Pretend you are pushing with your elbows, not wrists. This simple trick does wonders. Try it. Do not go overboard. Pectoral muscles respond best to short powerful bursts, so stay close range. Add reps. Instead of trying advanced versions like multiple claps, I have found bodybuilders do best with higher reps. If you cannot do even a single handclap push ups then do it with knees supported or leaning against a wall. Build on that. Switch to full version if you can do at least 10 knee supported or wall handclaps. Bodyweight bodybuilding is an excellent muscle building program without weights to build explosive muscle power and mass. 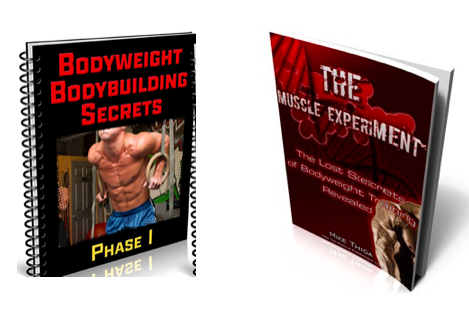 Find more about the bodyweight bodybuilding program here. As a home trainer or advanced bodybuilder your goal is to think outside the box. Plyometrics are being extensively used by bodybuilders to stimulate your muscles in new ways. Handclap push ups adds extreme and unusual loads to your chest muscles. Try them for 4 weeks to build denser muscles.